Now.. indians too know, why Bush has been voted the dumbest person in the united states and the most unpopular president ever in the history of the United States , oil prices have surged because of Bush war in Oil producing Iraq, Food prices have gone up coz Bush has converted the farm lands into ethanol prodicing fields to produce bio fuels, farmers in america are sowing this liquid gold and dont want to produce food grains they just want to make money making ethanol and thats the reason food prices have gone up , INDIA IS A FOOD EXPORTER AND NOT A FOOD IMPORTER . 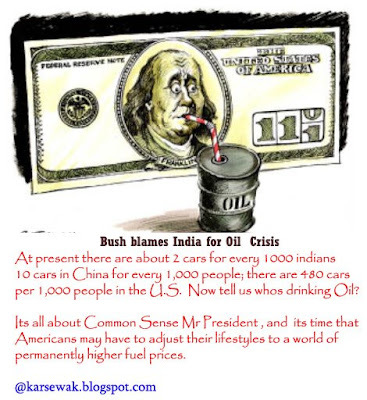 Bush improve your GENERAL KNOWLEDGE even a Third grader in India knows this basic Fact . Sonia Gandhi Family Links With LTTE ?